Origami Fold Fortune Cookie Book — This small book of Chinese proverbs is covered in origami print paper and fastened with a simple ribbon and a bead. The proverbs were acquired through many sources including Cyberscribes. I carved a chop of my initials from a white plastic eraser, and this is stamped on each page in red to add contrast. 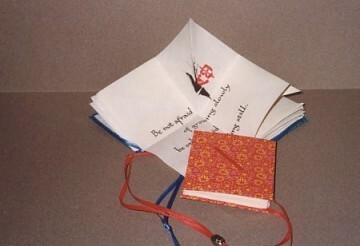 Book 3" x 3" (7.6cm x 7.6cm).